Our guests on Brew Ha Ha with Steve Jaxon and Mark Carpenter are Elaine St. Clair and Laina Brown of St. Clair Brown Brewery in Napa. Elaine has been a winemaker for a long time. 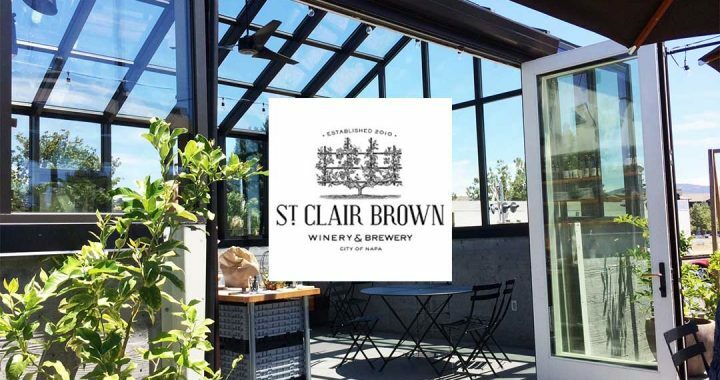 They started St. Clair Brown Winery in Napa in 2010 and they opened the brewery in February this year. They are tasting a honey wheat beer as they talk. Elena tells how they have been in Napa since 2013 but they have worked in the wine business for thirty years and worked together for twenty years at two different wineries. They had to fulfill a lot of legal requirements to open a brewery together with a winery. Their beer comes in attractive bottles, which are wine bottles with a porcelain closing crown. Elaine went to the Fementation Science program at UC Davis and has been working in the wine industry since then. In the 1990s she had a microbrewery called Napa Ale Works, which they sold in 1998. She learned to brew back then and now she is brewing again. They have a small operation, only 60 gallons at a time. They are experimenting with a wide range of beers, from Pilsners to the Red Ale which they are tasting now. It’s in the Irish style, with mild English Hops. Mark says that the winemakers have said that it takes a lot of good beer to make good wine. Steve asks about their winery. Elaine explains that she worked in production and Laina more in marketing. They worked together at Domaine Carneros and Black Stallion then they opened their winery when that winery was sold. They make Cabernet, a red blend, Syrah, Merlot, Zin, Rosé of Syrah, a Chardonnay, Sauvignon Blanc, Pinot Grigio and a sweet Muscat. The company is named after their last names. They are located in Napa, downtown. The city of Napa no longer allows new winery permits to be open to the public. So being in the city means they can stay open later and have a separate food menu with a full kitchen. They have a wine and a beer garden. They have two facilities across the street from each other. One is a production facility for wine and beer and one is a culinary garden, a 200 square foot glass greenhouse. They source their ingredients locally, such as the honey and wheat. It is hard to find hops locally but they have planted some in their garden and they hope to use them. But it is hard to find hops locally so they get theirs from Washington. Steve asks about the culinary garden and Laina explains she wants to serve the freshest food possible so they want to grow it themselfes. They have 60 fruit trees on the property. They coordinate the menu and work with different consulting chefs. They have a base of recipes that changes yearly. She likes pickling. They make Rosé jelly with dried rose petals and peppercorns, for example. After the break they’re drinking their Black IPA and Herlinda says it’s not super hoppy, subtle and elegant. Mark says it’s a good solid beer, not too high in alcohol, and not overly hopped. It’s a good solid black IPA with a nice roasty flavor to it. Why is it called Black IPA? They add 5% of the dark malt that adds color and a clean finish to the taste. Mark says that’s odd because the P in IPA stands for pale. They have the Greenhouse tasting room, but they also do tours and tastings on Fridays and Saturdays. Herlinda says that Sonoma Cider has suddenly closed, having lost its funding. They were located on the street where the roundabout was under construction and said that their business dropped 40% during construction. Before closing the show, Steve asks Mark to comment on the closing of Mendocino brewing. Mark says it’s extremely sad, it was one of the early successful craft breweries. They were purchased by an Indian company. Mark thinks the Red Tail Ale logos were the most beautiful labels in the business. It’s sad to see them go. There is no more Red Tail Ale. Maybe Bottle Barn has some stashed. They were also one of the first to start producing the higher alcohol beers.